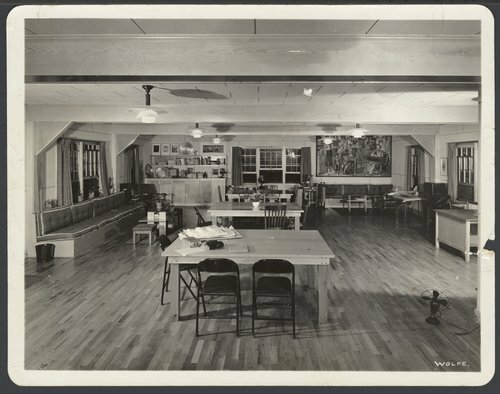 This is an interior view of the Arts and Craft Shop at Menninger Clinic which was later converted to the Canteen on East Campus. The mural shows the various craft activities carried on at the Menninger Clinic. It was painted by Mr. John Ballator, art instructor at Washburn College and husband of the Menninger occupational therapist. The woman sitting with a scarf across her lap represents Mrs. Ballator. The nurse is Miss Erickson and Mr. Stone is to the left of the nurse. In the background, the three Doctors Menninger (Dr. C.F., Dr. Karl and Dr. Will) are planting a tree. Beyond them is the farmhouse which was the first sanitarium and became offices of the Menninger Clinic. The mural was hung in 1940.